High quality and design vinyl tile stickers for any type of smooth surface. Easy to INSTALL AND REMOVE. Ideal for renters. Great and entertaining way to decorate and renew your home, furniture, doors, walls, tables. Forget about removing old tiles and messing up your bathroom or kitchen, just clean up and apply yourself our BRIKETO tiles with no mess. Our products come carefully packaged and contain twelve different designs with harmonious colors to fit different styles and places. They measure 6"x6" each and a full package covers about 3 squared feet. There are infinite possibilities for using our tile stickers, let your imagination work. Transform your appliances placing colorful designs on their front or sides, bring life to your kitchen. Use them on your staircase and renovate those plain looking steps. Remove at any time without leaving any residues or stains. Can be applied over any smooth surface such as tiles, ceramic, glass, metal, smooth painted walls, varnished wood, melamine or others alike. Not intended for use over floors or flat surfaces where friction will be applied. This high-quality tile stickers are very easy to install and also to remove when necessary. They are the perfect choice to give a new look to your home, office or furniture, without spending too much money. Awesome for kitchen backsplash this tile stickers can be installed in minutes. Don´t worry if you need to cut them, a regular pair of scissors or a cutty knife will easily do the job. The BRIKETO tile stickers are very easy to clean and they resist humidity very well. Just apply a humid piece of cloth to remove any superficial dirt. There is a great variety of colors and designs, if you want to look at all our models search for KOMYKON on Amazon. Our customers are very happy with our products and we do all our efforts to keep our clients satisfied. Try our products, if you don´t like them just return them.... there is nothing to lose. Give your place a new look. DIY. Change surface in minutes. PERFECT for renters! 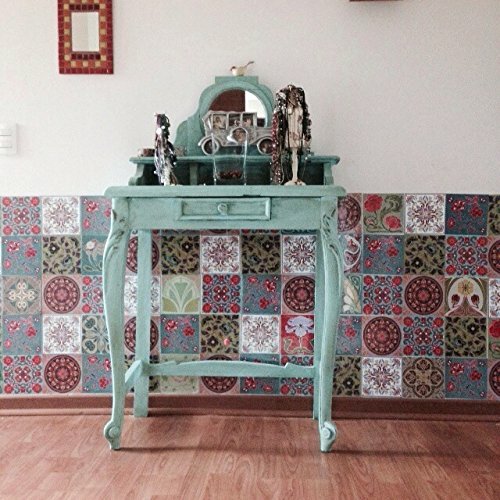 Renew old tiles and change your home. Easy to remove. PREMIUM quality HIGH definition tile stickers. If you have any questions about this product by VALDECO, contact us by completing and submitting the form below. If you are looking for a specif part number, please include it with your message.